92nd Annual Meeting of the Minnesota Section of SME - Society for Mining, Metallurgy & Exploration Inc. 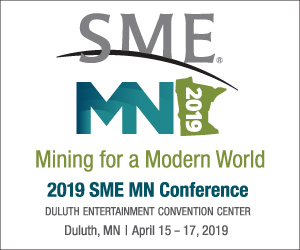 The 92nd Annual Meeting of the Minnesota Section of SME is THE top performing regional minerals conference in the Midwest. Featuring a wide range of sessions addressing pressing industry issues, emerging industry trends and latest industry technology developments this must-attend conference has a long history of being one of the top performing regional conferences in the iron ore industry. With more than 1,000 qualified attendees and an expansive exhibit hall featuring over 135 exhibitors, this growing conference is a must-attend industry event. 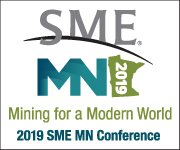 The 2019 SME Minnesota Conference features a progressive program, discussing the impact of future technological advancements in the mining industry and the modernization of the region. The program also features key industry thought leaders providing insight, analysis and practical applications on how to improve growth and development no matter the economic state of the industry.